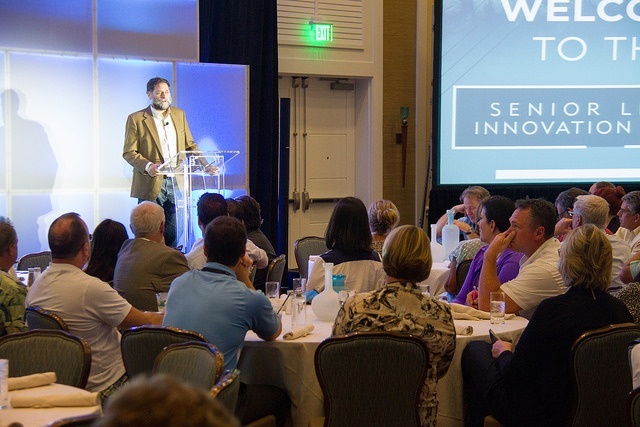 Dr. Bill Thomas, Founder of the Eden Alternative and creator of The Green House Project gave a provocative, captivating (and at times humorous) speech to kick off the 2015 Senior Living Innovation Forum. While he touched upon a variety of themes, Dr. Thomas focused a majority of his talk on the concept of the Continuum of Care. “The first thing that I’m on a rampage about these days,” said Thomas early in his talk, “are words that actually first appeared in the literature in 1982 in a peer-reviewed nursing journal. The words: Continuum of Care”. Dr. Thomas noted that after 30 years, he’s still not impressed. “First off, if something is going to be a continuum...it has to be continuous. But anyone in this room who's ever had an older relative become involved in aging services knows that it ain't continuous! Not even close." Dr. Thomas drove home the message that the MESH concept can lead companies in the senior living space to collaborate in very exciting new ways. “Technology, Design, Material science, Architecture, clinical care, better understanding of aging, all of that goes into the MESH’’. For many years during Dr. Thomas’ clinical practice, he cared for people who had been in a hospital and then came back to him, in many cases, worse off than when he sent them to the hospital in the first place. According to Thomas, the “continuum of care” has led us in the wrong direction. “American hospitals are killing our elders”. Hospitals are uniquely ill-suited for the wellbeing of older people. ‘’If I entered some bizarro world, where I was turned into a person who wanted to do the worst thing I could possibly imagine, for older people who are sick, I would design a hospital and I would put older people in it.’’ says Thomas.